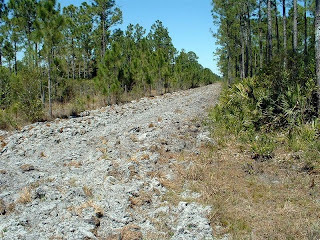 This section of the Tosohatchee WMA is completely separated from the main Tosohatchee WMA area by RT520, thus it is commonly referred to as "Tosohatchee South". It can be a little hard to find the entrance the first time you elect to visit the trails. There is a gate on the south side of RT520 that you must open, enter the parking area and then close after you. 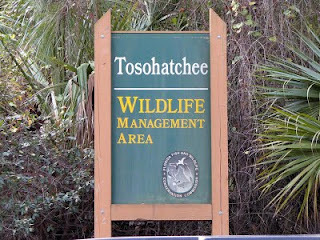 You will see the Tosohatchee Wildlife Management sign in the parking area so you know you are in the right spot. There is no fee for using this area. Once into the parking area, you will have the option of entering the loop trail from one side or the other. 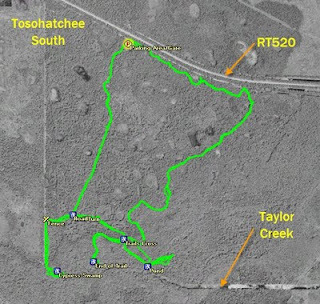 One section of the trail is mainly road so I normally take that direction to start the loop - that would be the road to the right of the Tosohatchee sign. This section will take you along the trails starting at the white blazed trail/road. As you walk down the road you will see quite a variety of trees and flowers. If you look to the left you should be able to see the remnants of some cattle dipping tanks. 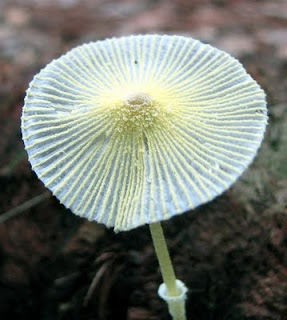 You will come to a point where the white trail will turn to the left. 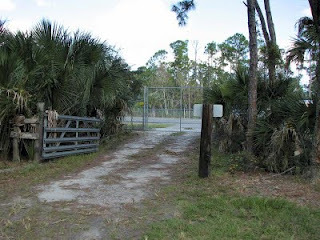 I suggest that at this point you take the road to the right out to the fence for a little exploring. Work your way down the fence line into the woods. 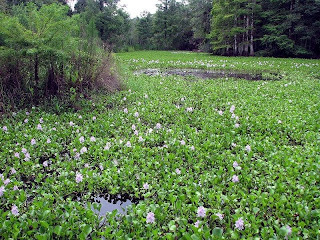 You will enter a section of the area that is a very nice cypress swamp. If the water is low you can get down close to Taylor Creek You might be able to get across Taylor Creek into a primitive camping area when the water is very low. Just be careful as it can get pretty muddy back there. Work your way back to the fence and them back to the white trail. The white trail will now enter a very nice oak hammock area. 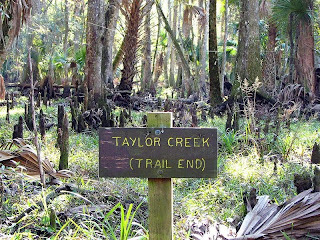 You will come upon another trail on the right leading to another section of Taylor Creek. Take a look around that area, then work your way back to the white trail. You can take the road to the right down to a nice pond area of Taylor Creek. 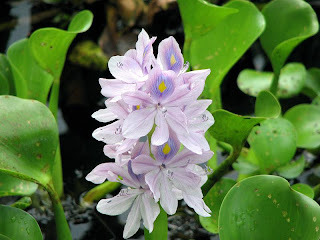 Depending on the water level you will see a different scene at each visit. Exploring around this area can be very nice. When done in that area, work you way back to the white trail and head north on the wooded section of the trail. 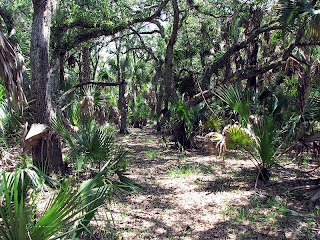 This trail provides you with views of the many different ecosystems that make up the area. This trail will take you back to the parking lot. I have hiked this area a number of times, discovering new spots each time. 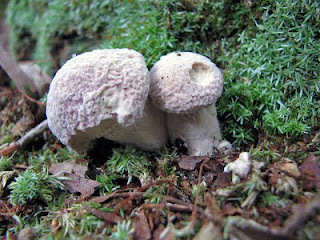 The variety of wildflowers and mushrooms has been quite extensive. 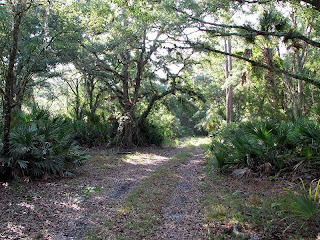 You cannot get lost in this section of Tosohatchee because roads, fences or water surrounds it. 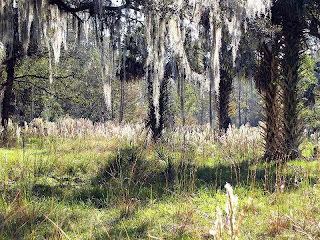 Thanks for the blog and the info on this trail - looking to visit Orlando soon and get the quintessential Florida sunrise/spanish moss/cypress tree photo. 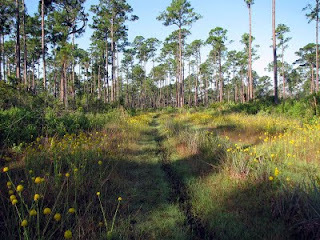 Awesome blog Tom, I think you have the most comprehensive info available for nature hikers in Florida. You have saved me a lot of time and effort and I'm able to get to the places that interest us now. Thank you for sharing all of your mileage, pretty darn impressive I must say.i just bought a little etrex GPS, now I need to learn how to combine it with Google earth so I can add my photos and kind of follow in your footsteps so to speak. Hi - thanks for letting me know that my blog has helped you. Google has changed their way of posting photos to Google Earth, in doing so removed all the photos I had posted to show people what was out there. They have a new system which forces people to be more in their grasp, thus I have elected to boycott it. Anyone who feels comfortable with the new rules, please go ahead and post your photos.